The 390013 Pendolino carries the name made famous by the resort’s first illuminated tram and an excursion train which took people across Lancashire for a Saturday night of dancing through the 1930s to 1960s. Blackpool Belle, which has also been remembered in a song by Lancashire folk band The Houghton Weavers, was suggested by readers of the Blackpool Gazette. The illuminated tram was based on a Mississippi paddle steamer and was in operation from 1959 until the end of the 1978 season. The launch of electric Pendolinos on the Blackpool route follows Virgin Trains’ reintroduction of direct services to London in 2014. 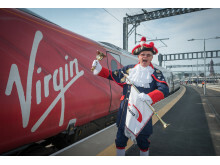 Pendolino 390013 was unveiled by Virgin Trains driver and avid rail supporter Martin Gurr, General Manager of Heritage Operations at Blackpool Transport. When he’s not driving Virgin services, Martin heads up a team of 60 volunteers that operate and crew Blackpool’s heritage trams that run along the Promenade. 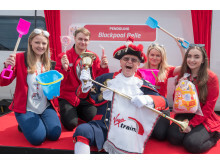 The introduction of electric services follows the completion of Network Rail’s work to electrify the line between Blackpool and Preston and lengthen platforms at Blackpool North station to allow the longer Pendolino trains to travel to and from the seaside resort. 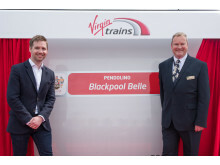 Michael Stewart, General Manager at Virgin Trains on the west coast, said: "At Virgin Trains we're really pleased to welcome Blackpool Belle to our Pendolino fleet, as we introduce our iconic Pendolino trains to the Blackpool route for the first time. We have been proud to serve Blackpool for the last three years and are excited to reach this milestone, as we strengthen our links to and from the resort with our Pendolino trains, which have helped to transform our west coast route. 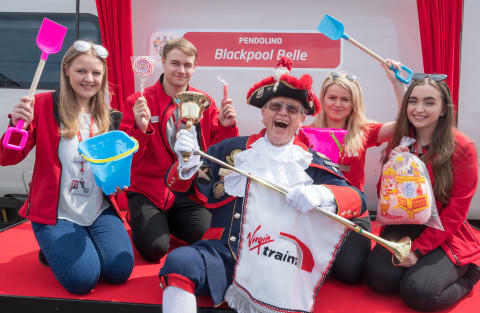 The name 'Blackpool Belle' is pertinent to Blackpool - it provided opportunities and firsts for the resort - which is what we hope our investment to deliver additional services will bring to local communities along the route. We're sure our new services will help bring more visitors to the seaside resort to explore what it has to offer - just as the Blackpool Belle did over 50 years ago - and we look forward to welcoming more people on-board." Cllr Gillian Campbell, Deputy Leader of Blackpool Council, said: "This is a truly historic day for the resort in that it represents the culmination of the biggest investment in our rail services for a century. The additional direct services to London, Birmingham and other towns and cities give visitors the perfect opportunity to jump on a train and sample for themselves the joys of our beaches, attractions and world-class events." *16,400 available between the capital and Blackpool; and 500 from Birmingham. Virgin Trains reintroduced direct services between Blackpool North and London Euston in December 2014 – with one northbound and one southbound service on weekdays. The 05.30 Blackpool North – London Euston and 16.33 London Euston – Blackpool North will continue to serve Kirkham & Wesham and Poulton-le-Fylde. Blackpool Transport is the successor of Blackpool Corporation Transport. It has been operating public transport for over 130 years. It operates a network of high frequency buses and trams across the Fylde Coast with 140 buses, 18 modern light rail trams and a much-loved fleet of Heritage trams. Blackpool Transport currently operates 14 bus routes, linking Fleetwood, Cleveleys, Thornton, Bispham, Poulton, Blackpool, St Anne’s and Lytham. The tramway extends 11 miles along the coast from Starr Gate to Fleetwood. A new tramway extension is currently under construction to link the tramway to Blackpool North station for the first time since 1963. 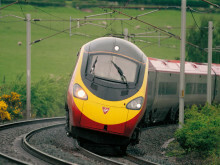 Stagecoach and Virgin are working in partnership to operate the West Coast and East Coast inter-city routes under the Virgin Trains brand. Together, they are on track to revolutionise rail travel across the UK.